Congrats to all theawesomtacullar kids!you are all changing the world ! Facing adversity, challenging situations and still doing Great things! The blue coats the white like the water coats the earth, covering it with beauty. The China is about to get thrown away, the Liberation China I thought it. My mother bought it after she moved out of her old life. Her old life most would consider hell, 3 jobs, 2 full time, 1 part-time. Learning at college full time and raising 3 boys. She bought the china to feel special, to make her life even more special then it was. I loved the way the images sucked you in, a man in a coolie hat fishing, his face a blur among the deep blue. The way the pole arched down as though a fish was forever caught in its hook of menace, almost free but the line keeping it on a leash. Stuck looking at his world from the inside out. My eyes trace along to the cups a whale jumping out looking from his world to ours, the lines of his body look like the waves he will never return to, his tail flicking out behind him, a protest to the winds that blow around it. A boat below, the simple sailor’s arms raised in shock of the fantastic beast above them. Then comes the bowl, another part of the china set. it’s simple shape giving way to the long fields sculpted around it. The trees so full in shades of blue, birds twittering with worms hanging from their mouths. And my eyes fade on the sun, despite being made of blue and white it shines brighter than a thousand of itself. I am drawn to this object, not unlike a moth is to a flame. It is a piece of history in my family’s tree, one that was about to be thrown away. I saved it, knowing that one day I will enjoy it greatly. I remember looking at it as a child, my large clumsy hands kept far down at my sides. It was always so high up on the shelves, a sapphire kept away from peasants unworthy of its sight, resting upon a mountain it’s shimmer always reminding them it was there. There was always a single day one of the biggest dishes was brought down, to bear Thanksgiving. Beets, sweet potatoes, mashed potatoes, sweet ham, and divine turkey. And somehow the platter always held my attention. It’s crisp blues and whites reminding me of dress whites my brothers wear when they come home from long months at sea. This object has face value to others because it’s nice china. But for me I feel drawn to it, it’s majesty unmatched. “China,” she replied unaware. I open it up and I am taken aback. It’s my favorite china. The cool blues peer up at me like a dog whose owner is holding a bowl of food. I ask my mom if I can keep it, she says of course. So we keep it in the box, it’s beauty perserved. School has started for about two weeks now, my mind slowly getting sharpened from it’s presence in my mind. My mom is driving the headlights carving a path through the darkness weighing down on the car. The inside smells of some rotting vegetable, probably because my sister left her food in the car. The air up this high is dry, mimicking all of California as it’s dryness claws its way into my mouth. The headlights flashes back at us, another mile marker flies by, swallowed once again by the ever hungry darkness. My mom asks me the usual, ‘how is my day’, ‘why’. I tell her I am writing about her china. She smiles her smile as faint darkness in her eye as she recalls all that’s happened in her life. When she speaks her voice is clear, a shout down through a valley. “I bought that china when I moved to my new house with your brothers. I bought them to make me and your brothers special, this beautiful china matching how I felt, Despite being a single mother of three boys, working 3 jobs and going to school. This china set let me have independence, it wasn’t just china, it was something more. Your brother Robert also liked the china, the plates especially. When they all broke except one he would always want that one. I am glad you want them.” We pull into our driveway pebbles shattering under the 1.5 tons of weight put on them. I am deep in thought as I go through the routine, getting mail, feeding goats, letting my dog out. I am thinking could I feel the independence, something I am seeking in my life. This weekend my teammates and I spent it building bonds,fixing arms and finding what brings us joy! Thanks to our sponsor Lockheed Martin for supporting us and coming to the competition to talk with us. I am so lucky to go to a school that promotes your passions. It has given me the opportunity to expand what I know, be curious for what I want to know and most importantly to give and share my joy and passion for serving others! FLL is a way I can pay it forward to younger kids and their love of Legos. It introduces them to STEM and teaches them team work. I spent a weekend at the kick off event on the Midway. What a great and awesome background for sharing what I love. I am encouraging you to find what your joy is! Do it, do it often! Use it to inspire change in others! Use it to inspire change in you! Introducing my tweam and our robot! Team 1538 / The Holy Cows, along with Alliance Captain 2659 – RoboWarriors and fellow Hall of Fame member 597 – The Wolverinesproud were the 2018 San Diego Regional champions! 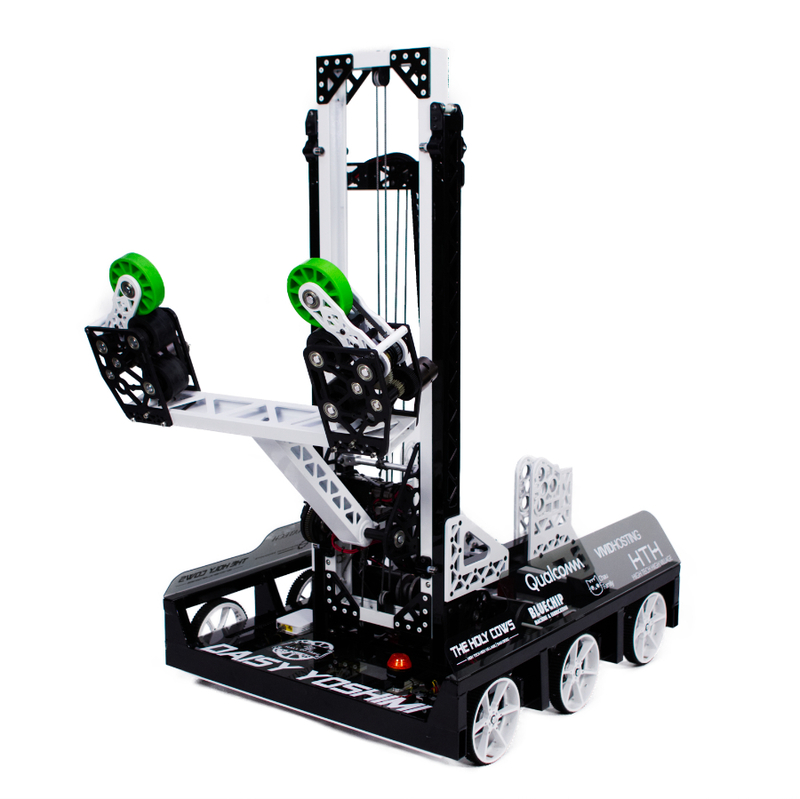 Designed for the 2018 FIRST Robotics game, FIRST POWER UP. in 2012 I was honored to be chosen as the Operation Homefront Navy Military Child of the Year. I was able to visit Dc and saw a lot of Hope in the other awardees.Now 6 years later my little sister has this same honor. She is pretty amazing and sometimes a huge pain. I look at all the things that she does and she inspires me and offers hope to do many people.i can’t be in dC with her becuase of Robotics but she makes me super proud! The 6 other military kids are just as inspiring.Follow them athursday and see their stories! As I sit in my humanities class writing during some chaos! My school as amazing as it is , is on alert, police line the street in front of our school a security officer walks our halls (something that never happened in all the years the school exists) And a threat, whether it be a bad joke or a real threat now exists in my world. It is making me wonder What inspires you! what inspires us to do good, do bad or do nothing at all! I am realizing as I get older this means different things to different people. As military kids I think we got a huge gift from my Dada. It came wrapped and beautifully presented to us on the day we were born into this military Brats life. It was the gift of true grit! What was in that beautiful gift …. a huge empty box, but the learned ability that my siblings and I could fill it how we choose. We could take all the experiences we have as military kids, good challenging, ugly and beautiful and make them into what inspires us to be great! I am not gonna lie we have a pretty positive family and that helps. But taking that true grit and using it to inspire your self and others can make the difference between being ordinary and great! It can be used to help inspire change ! It can be used to inspire others to make change! It can be used to impact the lives of others! My Pops has deployed almost as many times as I have years on this earth. My big brothers are half that but the stories they tell us when they come home make that time apart a learning adventure. The challenges and positives inspire me to pass that true grit on. We are safe in our bubble our teachers, advisors, police and our parents give us this gift today. But don’t wait to use your true grit. Inspire someone today! Who impacts our lives from the past?